So… I guess that’s it! I ran out of land! We are walking around the breakers (to the right of this photo) to the Long Point Lighthouse . These three t-shirts and one pair of shorts served me well over the last 250 miles. Until we meet again! Day 22… Wellfleet, through Truro, into Provincetown. 13 miles. Just one more day left! Not quite done yet. Three more miles through Provincetown, and I then three miles tomorrow along the beach to Long Point. My final push into P-Town…. 13 miles before the rains come. Hi everyone, here is the link to the Wednesday’s Today Show interview… Thanks again to Al, Mike, Ben, Jared and Johnny for driving up to Leicester and Worcester to follow me around. I think Jared, the producer, did a great job with the the editing (I liked the drone shots – that was a first – and the re-caps of my other walks, where you see the map and the pictures, were especially fun). I hope you enjoy! Day 21: Exactly three weeks on the road. 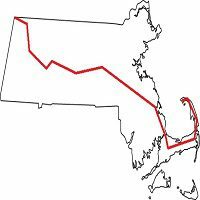 Orleans to Wellfleet, 14 miles. Mostly along the Cape Cod Rail Trail, and then switched back to 6A. I slept about two hours the last night, since I was working on website stuff in preparation for the Today Show airing. Very tired walking!